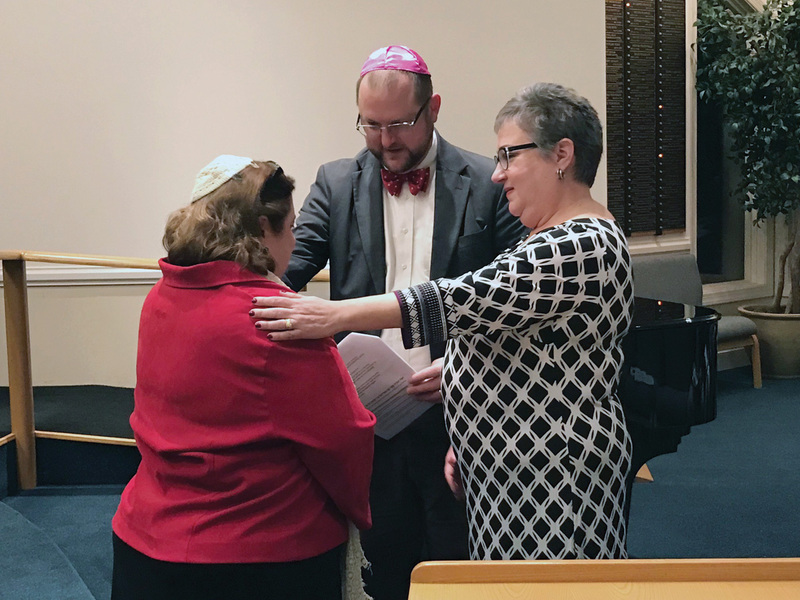 Rabbi Estelle Mills, left, of Temple Bat Yam was recently installed as rabbi for the temple in Berlin. Sometimes, people are called to serve a higher power at a young age. Such was the case for Rabbi Estelle Mills of Temple Bat Yam. “Growing up, my family was very active in the local Reform congregation in North Carolina where I grew up. I attended Jewish summer camps growing up, then got very involved in youth groups as a teen,” she recalled. While Mills began working at the Berlin, Md., temple in July, she was not formally installed until Nov. 30. She studied to be a rabbi at Hebrew Union College in Cincinnati, Ohio, and was ordained 27 years ago. Most of her career was spent in a congregation in Cleveland, Ohio, up until four years ago, when she and her husband moved to Parsippany, N.J.
“We had moved east because all three of my kids had moved out east upon graduating high school, for college, and then they have careers and decided to stay east,” she said. When her husband passed away unexpectedly, she decided she wanted a change of scene, and found Temple Bat Yam. Mills said every congregation has its own unique personality, and Temple Bat Yam is no exception. “Being near the beach… I’ve never had a congregation where the membership goes up in the summer and down in the winter,” she laughed. “It’s usually the opposite. Mills said the winter the congregation is made up of about 130 families and swells in the summer months. Mills said one of the reasons she became a rabbi was her love of teaching. Mills said she’s excited to join the community and is looking forward to serving it for years to come. Temple Bat Yam is located at 11036 Worcester Hwy., Berlin, Md. For more information, call (410) 641-4311 or visit templebatyam-OC.org.